We are each unique and have a special gift. We have an opportunity to embrace our bonus years as a time to learn, grow and evolve. We owe it to ourselves to reflect on our life, harvest our experiences, perspective and wisdom and live our life with intention so we don’t reach the end of our life with regrets. Our goal is to discover our gift, live our purpose and to help make a difference for our world and planet. In my early twenties, strangers saved me from drowning. That experience shaped my approach to life as an adult. Realizing the fragility of life, I learned not to take life for granted and to make intentional choices about how I wanted to live. By age thirty-three, I had gotten married, moved to Boston, received my doctorate, and started a private practice. After deep reflection, I also realized that my marriage was not working, and I needed to end it before starting a family. The next several years were focused on my professional development and career. And then, in a new relationship, my focus again began to shift to wanting a family. In my early forties, with my new husband in his mid-fifties, we decided to do some individual soul-searching about how we wanted to live the next part of our life. During this time, I went on a trek with other women to Nepal. On the trek, I spent time reflecting on my life and realized how important it still was for me to be a mother. At home, David did his own soul-searching. When we were again together, we discovered we were in agreement: we wanted to revisit the issue of trying to have children, despite our age. It took almost ten years. At age fifty, with my husband in his early sixties and when many of our friends were becoming grandparents, we became new parents for the first time. Now, in my early 70’s, our son, Louie, is in college. We’re all blossoming. 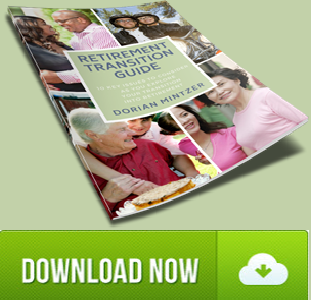 My life is an example that there is no “one size fits all” retirement transition. There are some specific advantages of being older parents. We are in a more comfortable financial situation than earlier in our careers, and this enables us to have more flexibility with the experiences we can create together. Since we are healthy now, we go on active vacations together as often as possible. Louie has grown up sharing our love of hiking, biking, sailing, and skiing. He has told us that he loves his life and the adventures we share. There are also disadvantages that pose challenges. We are older than many parents who experience an “empty nest.” Now that Louie is in college, David and I are continuing to work part-time as well as travel and spend time with family and friends. My hope is that we will continue to sustain our health and energy, enjoy the coming years and be able to watch Louie as he grows and develops his own life. But, we know there will be bumps along the way and, like everyone; we will have to deal with whatever happens. We are out of sync as a family in our retirement transition. In some respects, I’m in the “prime” of my work life, while David, in contrast, is “winding down.” He’s given up his administrative responsibilities and now works part-time. We each love our work and want to keep working, in some way, for as long as we’re capable, so there’s no “total retirement” in sight. I love my “portfolio career,” where I offer some therapy and coaching as well as writing, teaching, speaking, group and workshop facilitation and consulting. I also love exploring other aspects of my creativity that I put on the “back burner” while doing other things. Over the years, especially as Louie was growing more independent, I discovered that writing was a natural outgrowth of my speaking and my personal and professional interest in the transitions people experience in the second half of life. 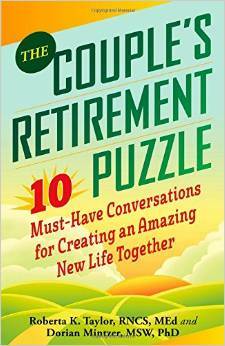 I collaborated with Roberta Taylor on our book The Couple’s Retirement Puzzle: 10 Must-Have Conversations for Creating an Amazing New Life Together. I’ve also been a contributing author to a number of other publications. As I reflect on my life, these recent years have been my happiest and best. I am proud of my professional accomplishments, and I love my husband, son, and community of friends, family and colleagues. Through some health scares and challenges, I have learned the importance of resilience and a positive attitude. David has opened my eyes to healthy and vital aging. Although older than me, he is “young-old.” I also feel grateful that I have a supportive network of family and friends. I am particularly blessed with some special women friends who live near and far. We’re there to listen to and support each other. Having my own private practice over the years has enabled me to control the hours and amount of my work. I have welcomed connection with other professionals interested in positive aging. 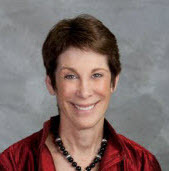 I began my Boomers and Beyond Special Interest Group in May 2007 and have been involved in the Life Planning Network, Sage-ing International and a number of other organizations which have given me opportunities to connect with other people on a similar life journey. I’ve also enjoyed being able to bring experts to other professionals and the general public through my 4th Tuesday Revolutionize your Retirement Interview with Expert’s Series which I began in May 2012. My work has enabled me to use my professional life planning expertise, interest in positive psychology and adult development, combined with my life experiences to work with people as they are transitioning into their second half of life. My retirement transition is an ongoing process, one that has involved self-reflection, conversations with David, Louie and other friends and family. Trying to find the balance in life is a continual challenge for me. Retirement, for me, is indeed a journey and not a destination. I hope you’ll find help and inspiration to craft your own journey while you visit this website. To build a vibrant community for people mid-age and beyond who are pioneering new ways of living in the second half of life. 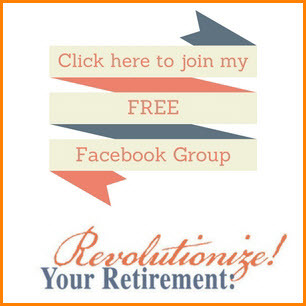 To be a passionate advocate for “revolutionizing” the concept of retirement. 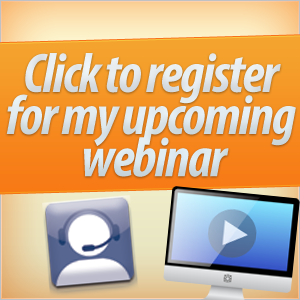 To promote and exemplify the paradigm shift about aging as a time to grow, learn and evolve. To help confront internalized and societal ageism. To inspire aliveness, authenticity, contribution, and positivity.